Surprise, surprise...they're not red, or orange, or golden yellow. 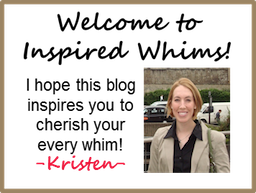 But they are warm and inviting, rich in tone, and full of depth! 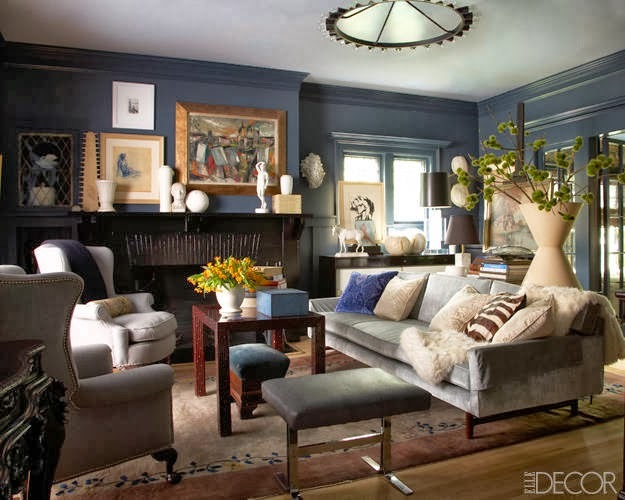 1) A dark blue wall definitely draws you into this space. Stand-out artwork, white vases and sculptures, and neutral furnishings with rich textures balance out the moody depth of the color. For a similar look, try Benjamin Moore's Blue Note (2129-30). 2) An olive green hue creates the perfect ambiance for a relaxation and snuggle station. Who wouldn't love to have a little area like this in their home? 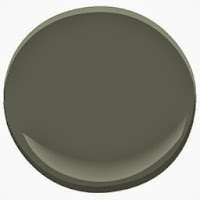 For a similar look, try Benjamin Moore's Dark Olive (2130-40). Have you seen any Autumn colors that have you ready to warm up your space with some fresh paint? Do tell! I kinda love that first room. Don't know what it is, but I'm diggin' it. That second color is damn near identical to the color I painted my bedroom when I first bought my house. I called it "Elephant." And I loved it.